Let’s assume that the children have had time to settle into the classroom environment and that you are ready for them to begin the first lesson. This is their best learning time. They have focused in on an English environment and have had a short time to adapt to the change from their last situation. This first lesson will include the most difficult material to be taught. It will likely include listening, and because listening and understanding are the most difficult, this is the best time to give your oral explanation. This articles provides suggestions for getting the children excited about your lesson. – Have a picture that represents your subject matter. – Draw on the board as you talk. Don’t worry about your artistic abilities. The children will love it if their drawings are better than yours. Funny things facilitate learning. – Take advantage of their drawing ability and have them draw small parts of what you are explaining on the board. They will be listening! They’ll be laughing and involved, learning English will be exciting. – Dramatize what you are saying with your own actions. Sometimes it seems that teachers need to be able to do everything! – Follow your own dramatics by giving the children a chance to imitate them while you give them the language. How Can You Capture Every Child’s Attention? – The first lesson needs to present something of interest. It might be a song, verse, picture, or a map. Most children are fascinated by machines or electronic equipment. – If you are using a textbook you have purchased, it might be effective to display some part of it using an overhead projector. – Children relate to computers. When they sit down at a computer they give it their full attention, no matter what problems they may have. – Perhaps you are wondering how to include boring subjects such as phonics. If your lesson includes identifying rhyming words, listening or phonics , then this is the time to teach it. Using any of the teaching aids mentioned above or any others you may have, move into the difficult content. Let’s suppose you are teaching rhyming words . Have the students listen to a funny / interesting verse. 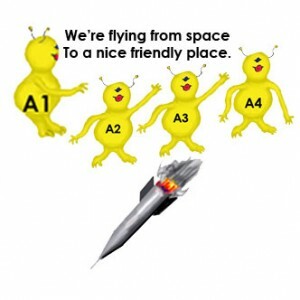 Explain that A1, A2, A3, and A4 are friendly aliens.They’re flying to Earth in their rocket. On the Internet children can see the rocket zooming in to land near their home. A1 is introducing his friends to all the kids on Earth. Have the children repeat A1’s introduction and identify the rhyming words. If you are teaching specific sounds or rhyming words, make up or use a program that offers meaningful examples of what you are teaching. Use examples that are fun so the children can enjoy repeating them. They will learn if they are enjoying the lesson.